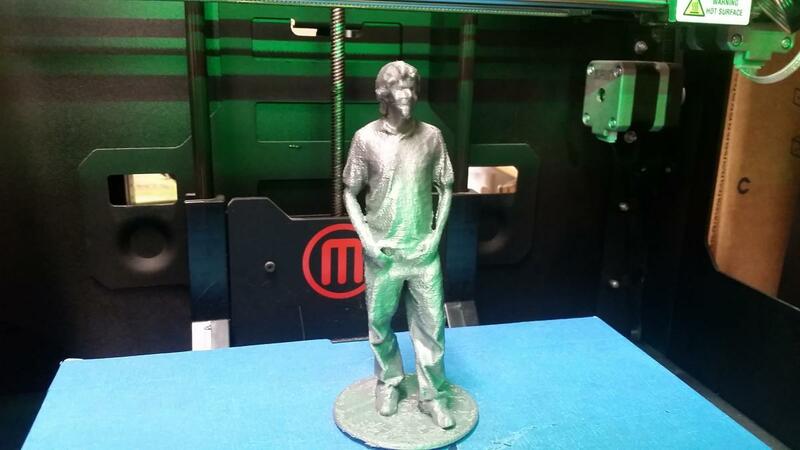 In this project you will use the kinect scanner to scan your self then you will make it into a 3d print. The computer by the vinyl cutter has an kinect scanner connected to it. This scanner can capture the 3d data from objects that are the size of a person. The Kinect looks like a black bar that is about 8 inches long and has lenses on it. It has a USB cord that splits. Make sure to plug in the USB cable to the split wire (power and usb). Please also unplug when you are done. On the computer you will find program called "Skanect". This video tutorial tells you how to use the software. For this step you will need a friend. They will hold the scanner and walk around you doign the scan as describled in the video. Start with scanning the entire face then work your way around the body. Make sure they scan up and down. You will need to stay completely still during this process. Before starting make sure you have enough slack in the UBS cable to the scanner. It will probably take a few trys to get it right. There are tools in the Skanect software to cleanup your model. These are going to be the fastest way to get started. Advanced uses may chose to work with MeshLab or MeshMixer. In this project we will use the tool build into Skanect. After you have completed your scan go to the "processing" tab. You will want to use the adjustments in the crop tool to trim your model to the area you need. Then you can run the option that removes small isolated objects. This should give you just your main scan however there may be holes in it. For that ou will want to use the "watertight" process to fill in the holes. At this point you can export the file to STL. Add the resulting STL to the 3d printer slicer and print as you would any other object. You may choose to use a CAD program like TinkerCad to add a platform on which your model is standing.